New Zealand Art Print News: Tony Ogle talks about his new print "Matapouri Window"
Tony Ogle talks about his new print "Matapouri Window"
Tony Ogle doesn't produce a lot of prints. Sure, viewed as a single collection created over several decades he has amassed an impressive body of artwork but it has actually been a six month wait for a new print since his last edition (Time Out Tongaporutu) arrived in stock right at the end of 2011. In Tony's latest print "Matapouri Window" shown here the artist returns to his geographical roots. Many years ago Ogle, together with fellow printmaker Tom Burnett, established a screenprinting workshop at Matapouri Bay, a charming sandy beach 40 minutes from Whangarei and 5 minutes from the fishing mecca of Tutukaka. Compositionally the print uses the device of a window to create a view within a view. Tony says it's an idea with a venerable tradition in art history, "It works well to create depth and gives the impression of a picture within a picture. (a frame within a frame)" and he says "people love 'views'". Matapouri Window is a deliciously colourful print, an exhuberant celebration of screenprinting technique that lines up multiple colours perfectly. There are actually a total of 17 separate solid colours and 2 grey glazes used to make this print. It transports the viewer to Northland, to a time of year and day and to a state of mind. As we say in our catalogue listing, it is "the quintessential Tony Ogle print". Tony Ogle has been working as a printmaker for a long time but when we asked him how long it took to print with the complexity of "Matapouri Window" he told us that he spent "6 days working on separations off the original. 1 day preparing the screens, 2 and a half days mixing colours. I averaged 3 colours printed on the 200 sheets so approx. 7 days of printing." As a comparison Dame Robin White when she was asked about her early printmaking experiences in our May interview, she said "I started in the beginning of March and worked on [the print] full-time and finished it about the first week of April, so it took me well over a month - working every day, eight hours a day or sometimes more". Printmaking by hand is definitely hard work being technically demanding and time-consuming. "What about the complexity of the image?" NZ Art Print News asked Tony "Did you have a higher number of A/Ps (Artist Proofs) than normal to get the registration right on all those stripes?". Ogle told us he had "Only 3 complete rejects plus a small number that can be successfully hand retouched. Successful registration relies on a number of factors - accurate separations firstly, lining up registration marks on screens and care placing paper into registration tabs on the table." And lastly we asked Tony about overglaze that he has used for the first time to accent the shadows and add further depth to the print. He told us that "Glaze consists mainly of clear acrylic solution - so it is very watery compared to creamy paint. A small amount of black was mixed in to give the shadow effect whilst allowing the colours to still show through." We had heard that the glaze had been a bit tricky to apply. Tony said ruefully that "Any hair or chip of paint lying on the surface of the print will be highlighted by a glaze not overprinted like other colours so keeping things clean is important. Also you need to give the prints time to dry properly otherwise the glaze will stick to the paper when stacked up." This new print is already selling steadily despite being listed for sale for just a few days so far. 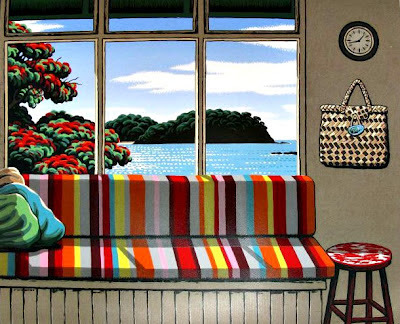 If you collect the work of Tony Ogle "Matapouri Window" is highly recommended as it is large, technically complex and extremely attractive - you can buy this print online here or call NZ Fine Prints on 0800 800 278.